Yeovil put a second-rate MK Dons side to the sword at Huish Park as they booked their spot in the Checkatrade Trophy last 16, winning 4-1. After a poor first half, Alex Lacey's own goal separated the side at the interval, but it wasn't a pretty affair though Dons looked the better side under new boss Robbie Neilson. But Yeovil, who came into the game eight unbeaten, were a different force in the second half, but were gifted the lead as Dons gave away two penalties, converted by Kevin Dawson and Francois Zoko respectively to put them ahead by 62 minutes. Having been booked in the first half, Samir Carruthers' rash challenge on Ryan Hedges earned him a second yellow and his subsequent marching orders, which the home side took full advantage of as Lacey made up for his earlier mistake to add the third before Ben Whitfield headed home a fourth. There was an air of familiarity, and yet an air of the new too in Robbie Neilson's first game in charge. While the formation looked the same on paper, Chuks Aneke was handed his first start since signing for the club in the summer as the new manager made nine changes from the side which started at Charlton on Saturday. There was little to separate the two sides in the opening 25 minutes as both were as bad as each other. Kabongo Tshimanga had been given starts in the group stages, but was barely involved, this time around though saw much more of the ball, as Dons went direct. The long balls though often looked aimless. Ironically though it was one such ball that saw Dons take the lead. Ryan Colclough, who had done little until that point, lumped another long one forwards for Tshimanga to chase, but Alex Lacey clearly didn't hear the call from keeper Jonathan Maddison as he headed it back towards goal, only to see it bounce into his own net to give the visitors the lead. Despite being ahead and playing the better football than their opponents, there was little Neilson to be pleased with. Passes were being over hit, lumped aimlessly and possession was given away freely - though fortunately Yeovil weren't any better. But the home side were given a way back into the game just three minutes after the restart though when Paul Downing, who until that point had been a fairly solid member of the side, was adjudged to have downed Tahvon Campbell as he skipped into the penalty area, earning his side a spot kick. Ryan Dawson made no mistakes with the penalty, beating Lee Nicholls' dive, despite guessing the right way. Yeovil were certainly a different beast in the second period, and were by far the better side and were making the match much more of a spectacle. 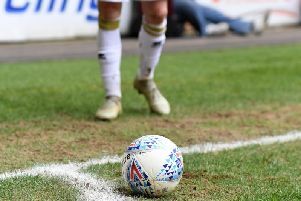 And they turned the match totally on it's head in the 62nd minute when Daniel Powell was adjudged to have handled in the area to earn Yeovil another penalty. This time Francois Zoko did the business to beat Nicholls and put Yeovil 2-1 up. That challenge was made even harder when, with 23 minutes to go, Samir Carruthers picked up his second booking of the night for a rash challenge on Ryan Hedges, and the home side certainly capitalised on their numerical advantage. Yeovil put it to bed with 18 minutes to go when they rattled home their third. Alex Lacey, the man responsible for heading Dons into the lead, controlled Zoko's cross and hit it brilliantly on the turn to bend it into the top corner past the hapless Nicholls. They completed the rout with 12 minutes to go when Ben Whitfield got the march on Downing to power a header past Nicholls, netting Yeovil's fourth.